A compelling essay on free will from an internationally recognized authority on atheism, and author of God: The Most Unpleasant Character in All Fiction. Do we have free will? And if we don’t, why do we feel as if we do? In a godless universe governed by impersonal laws of cause and effect, are you responsible for your actions? Former evangelical minister Dan Barker (God: The Most Unpleasant Character in All Fiction) unveils a novel solution to the question that has baffled scientists and philosophers for millennia. He outlines the concept of what he calls “harmonic free will,” a two-dimensional perspective that pivots the paradox on its axis to show that there is no single answer—both sides are right. Free will is a useful illusion: not a scientific, but a social truth. Whether or not you agree with the thesis of this elegant little book, you’ve got to love some of the imagery: a tame chipmunk named Little One, a Grand Canyon sunrise in our minds, the opposite musicalities of Barker’s parents, and more conceptually, his notion (derived from physics) of a “sum over future histories, resolving into the now.” The whole structure of the book is built around a lovely paradigm, the idea that apparently conflicting judgments can be true along differing dimensions. The book is well worth reading for qualities like these, and for its quiet precision of language and analogy. Its appeal is poetic rather than polemical though, and after reading I found myself disagreeing as profoundly as ever with its core assumption. That assumption is expressed several times in the book, but without much support, as if it were a settled matter of science rather than a leap of faith. For instance in the sentence: “Your actions are all predetermined by unconscious natural causes before you are aware of them.” While reading, I kept expecting Barker to backpedal and start replacing the word “predetermined” in statements like this with something less absolutist like “constrained.” But the line of thought never budges from strict, dogmatic determinism, the belief that there is an unbroken chain of inevitability tracing through all events. And yet that whole wild extrapolation of strict causality is, first of all, so counterintuitive. As a jazz musician and an author, can he really believe that each note or word he’s ever been inspired to reach for was written already, eons before anyone’s birth, in some minor imbalance of the pre-atomic plasma? Forgive me, but isn’t this just reconfiguring the traditional omnipotence and omniscience of god into an equally mystical scientism? Of course causality exists, David Hume notwithstanding; and we observe it in particular in certain mechanical relationships that are readily induced and measured. But there is no reason to postulate the total absence of any relationships other than strict causality among events, such as might be represented in consciousness. Certainly our experience of life tell us that we are at least somewhat free, and why should we assume that such a fundamental level of experience must be illusory? It seems so much more plausible that nature and the sequence of causality create parameters for us, capacities of various kinds, instincts, predilections, etc, which yes of course are rather deterministic at the population level - but that at the same time sentience is able to carve a degree of genuine individual freedom within this flow of events. The analogy would be life itself, and its ability to carve a niche of evolutionary order as a kind of back-current in the flow of entropy. There is of course no syllogism to prove that free will exists. The determinist can answer any seemingly free action by insisting it was foreordained. You can even argue, seemingly irrefutably, that determinists are inconsistent in their own lives, because they make efforts of various kinds (writing books, raising children, resisting enemies, etc), while allegedly considering all effort to be futile. But of course the answer even to this is, I do so only because I have no ability to do otherwise. Perhaps the most marvelous feature of Dan Barker’s charming book comes roughly halfway through. Namely, while he was typing one day out on his back patio, Little One (the chipmunk) hopped onto his keyboard and made a random hyphen. Barker left the hyphen in. He would have us believe that neither he nor the chipmunk had a choice in the matter. What a gem of a little book this is! Beautifully written with stories, analogies, and models that uniquely resolve the paradox of free will in a deterministic universe. This book is a joy to read because of Dan Barker's new way of looking at the free will debate. The author deftly incorporates his musical background to aid our understanding in a satisfying way. Just as melody and harmony create beautiful music so does society give meaning to our individual lives. The end result is harmonic freedom that frees our minds from the debate scientists and philosophers have waged over the millennia. To see it from Dan Barker's perspective is to assert the truth of science and the truth of what it really means to be fully human. 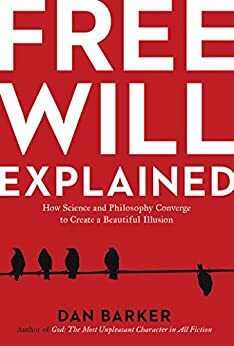 I highly recommend this book to anyone who wants a basic introduction to free will, as well as to those who are well seasoned in the field of the free will debate, and would like to see it from a fresh perspective. The debate over free will and determinism has divided philosophers for thousands of years. I have read several different books and articles on the subject and while I find myself leaning toward the deterministic side of the debate, I am still ready and willing to read and study opposing viewpoints. My desire to expand my knowledge led me to obtain and read Free Will Explained. Starting off with a quick definition of free will and determinism, the book then attempts to develop its argument, which is that free will and determinism are not opposing sides. They are actually logically different, or acompatible, if there is such a word. The true debate, according to this book, is between supernatural determinism and natural determinism. Free will and determinism are actually not in opposition and both can, and do, exist in the day to day world. As I said, I tend toward the deterministic side of the traditional debate but like many other people, I still struggle with the free will concept and wonder if we do, in fact, possess free will on some level. I know that science shows, more and more, that what we do is a product of predetermined events and we don’t really have free will the way we think we do. Still, I can’t help but believe that I am a free agent of my decisions. This book asserts that we are, indeed, the free agent and responsible for what we do, even though free will is an illusion. This seems like a contradiction, but the argument presented in this book is that it really isn’t a contradiction because it is possible to have both free will and determinism because they are not opposing ideas. To back up what it claims, this book is loaded with analogies. I like and appreciate the use of so many different analogies because, if one doesn’t quite make sense to you, all you have to do is read another one. I wish more authors did this- they often present a single analogy, sometimes one that is too complex, and expect the reader to understand. With this book, there are enough analogies used that one is bound to ring a bell with your level of understanding. Since I tend to be more mathematically inclined, I really liked the analogical explanation in the book that references imaginary numbers. Every reader will find an analogy that works for him/her, and this makes the book’s key points easier to grasp. With its insistence that free will isn’t necessarily real and yet still real at the same time, there are bound to be those who are skeptical with this book’s claims. To say that we have free will, then admit that free will is an illusion, albeit a useful and necessary one that we just need to accept, flies in the face of scientific facts and reason. I feel like the book is making contradictions, but I still appreciate what it is trying to do. The book insists that free will only comes into existence when we make moral judgments. It claims that free will is, in fact, what we get when we combine science/determinism and human judgment. I kind of get what the book is trying to say, but I still cannot get over the idea of free will as something that doesn’t exist, but does exist, once you look at it differently. We may never get to a definite conclusion in the free will vs. determinism debate and Free Will Explained is not likely to inch us much closer to a conclusion, since the science still refutes that free will is real. Still, I like this book for its ability to at least approach the debate from a different angle and I like its many analogies that attempt to make sense of something that could prove too abstract to most readers. Read it for yourself and see what happens. You may come away with a completely different understanding in this ongoing debate.